Looks good, nice and clean. I think Streamfixer does that to the new guys. :shrug9: mine didn’t straighten out until after 1000 posts. Yikes....LOOK....what’s going to happen to me when I pass 10,000 posts ??? No beer money but I got some Crown! Darci's Raycor is bolted to the Starboard upright in that area just above the fuel inlet. You will have room to change the element. A tuna can is a good size to drain off any watery goo from the clear bowl. A short section of hose is needed to fully drain things when you change the element. Although mine is not a Racor, so I don't know how much larger the Racor's are, but mine is mounted up there too, with no kinks. Mine is the same. It will fit! I may be able to run the hoses straight out the back of the filter but I did a mock-up with the filter and I’m not sure I would have room with a quick disconnect. With the 90 degree fittings I can come off the front of the filter and have plenty of room and easy access to the quick disconnect. I’ll find out when install it. Is there any problem with fuel being restricted with the 90 degree fittings? Love the SS filter housing. It’s tight in there, but works well. I have one line out to the main and another out to the kicker. I change the filter every spring. I agree! I’ve never found a drop of water or speck of dirt in my fuel. If my filter was plugged, last thing I would want to do is bypass it and tap into the fouled tank. Onboard I keep a separate emergency tank of 5 gallons with a new fuel line coiled up ready to use. 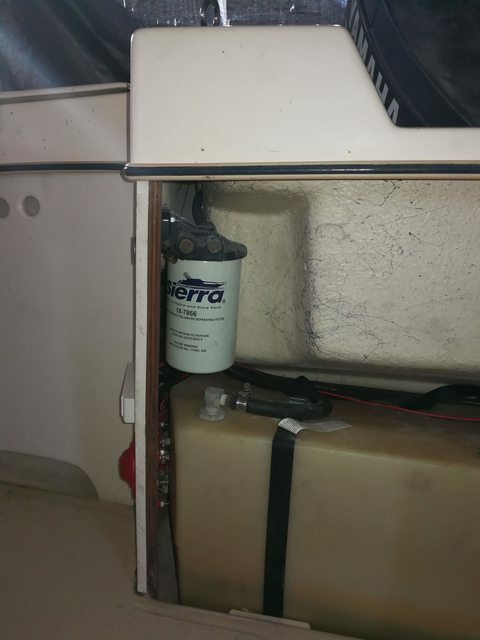 Should I have fuel trouble on the water, I will disconnect at the motor and connect my emergency fuel directly and try to get home ASAP...on the kicker if necessary to conserve fuel. If your motor has 1/4, I'd stick with 1/4. 3/8 provides greater flow, but I can't imagine your motor is going to need it. My Honda 225 uses 3/8... my old Suzuki 90 used 5/16. Fisher - do you have room under the port sponson for a portable tank? That way you could run your Honda from a remote tank in the event you have an issue with your fuel filter? I use a portable 3 gallon tank as a backup as well, with a Yamaha fuel line attached. I like John's idea, where you just have to disconnect the built-in tank connection at the Honda, and re-connect with the portable. Why not just carry a spare filter element and appropriate strap wrenches? That's what everyone I know does. The whole point of having the Racor is to have a very good water separating fuel filter that filters down to 10 microns. If it gets a slug of water, you can drain it. If it gets so plugged up it causes a fuel restriction, you can swap it out in 3 or 4 minutes (make sure you put a little grease on the rubber seals and on the plastic bowl threads ever time you install a new one to make them easier to change). I can see wanting a second tank if you want to increase your range... but bypassing a Racor fuel filter to run a portable tank in case you have bad fuel issues seems kinda silly to me. Like bypassing the oil filter in your car and running a second oil tank in case you have an oil filter restriction. It can be a little tough to get the clear bowl off the filter element when replacing the element. Tough to make a strap wrench hold, and channel locks will break the fins. Racor makes a wrench specifically for this... West Marine carries them. I actually have a spare filter as well.. Overkill maybe, but I like having the extra 3 gallons to get me home if I need it.. So just to be clear on the filter swap on the water would I connect a small length of hose to the bowl drain, open the petcock, drain into a small container with a lid, put on new filter, prime fuel bulb and be on my way? Just want to be sure I know how to do it correctly before hand. The Racor filters use a fuel bowl that is a separate part than the actual filter. 3WT was saying that it is REALLY hard to unscrew the plastic bowl from the filter after it has been on for a year. I carry a spare filter and a spare bowl and an oil filter strap wrench that is correctly sized to unscrew the filter from the head bracket. I struggle to remove the bowl even at home using a money wrench and vise or a strap wrench. You can also use a valve to select between your tanks.